Home / entertainment / events / mca music / Music / nyoy volante / tuloy pa rin / Nyoy Volante continues his music journey with new album "Tuloy Parin"
Nyoy Volante continues his music journey with new album "Tuloy Parin"
We all know Nyoy Volante for being the mellow that he is when he sings and everyone credits him for being such a remarkable acoustic artist, bagging the title "King of Acoustic Pop". 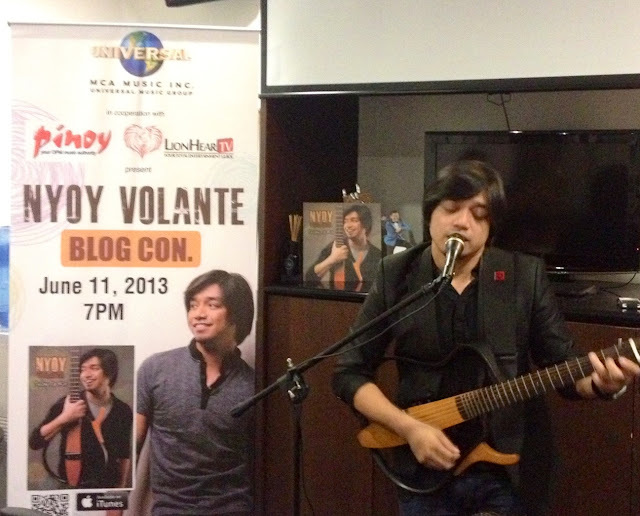 Nyoy Volantes is back with a new album "Tuloy Parin" under MCA Music, singing around and pulling those strings in his guitar. He really had brought in a significant contribution into making OPM alive and kicking, there's no doubt that the spirit of Original Pinoy Music is still thriving on. 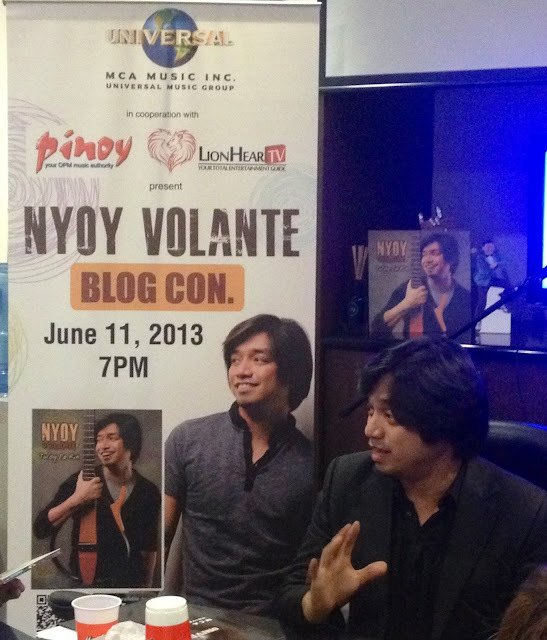 Last June 11, 2013, Bloggers were invited to meet him and share the good news of a new album. Nyoy Volante serenaded them by singing hits from his new album and chatting with them about some updates on his career. They get to have his new album signed as well. 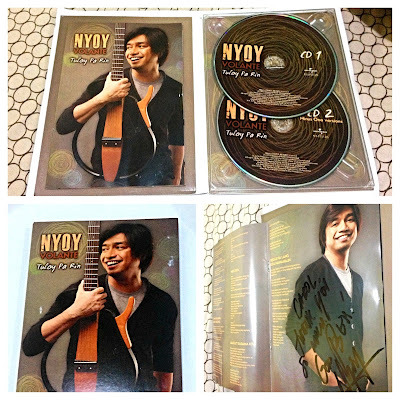 "Tuloy pa rin" is an all tagalog tribute album dedicated to all the OPM fans and listeners. This new album was produced and re-arranged by Nyoy Volante himself (except for "Kamakailan lang" and "Sa Isip ko") where in the album features his versions of well-loved OPM hits "Ipagpatawad mo", "Bakit ba GAnyan","Tuloy pa rin", "Magkasuyo Buong Gabi (featuring Sabrina)", "Nandito Ako", "Sa Isip Ko", "Sana Dalawa Puso ko", "Bukas nalang kita mamahalin", "Basta't kasama kita" and "Kamakailan lang". The album also includes 2 of his original compositions, "Pikit" and "Miss Kita". "Pikit" is his favorite, which he randomly sings all the time, while "Miss Kita" intended to be a sweet love song but somehow turned out to be a pop jazz number. He also directed the music video of "Pikit" as well as "Bukas nalng kita mamahalin". Coming up with this new album was never an easy job for Nyoy Volante for he faced greater responsibilities and challenges as he has grown to be multi-faceted artist and talent on this new album; To mention, aside from being a singer, song writer and a musician, he is also an arranger, producer, actor and video director. He recorded and arranged the album at the comfort of his home. While working with the album, Nyoy Volante is actively engaged in musical theater as part of the successful musical, "Rock of Ages". He is also a part of ASAP Sessionistas which can be seen every Sunday at the variety show of ASAP in ABS-CBN. Currently he also continues to be in demand for shows here and abroad. With all these experiences and blessings, Nyoy Volante had indeed expanded and became a Jack of all trades when it comes down to his field of artistry and talent. Nyoy Volante is thankful for his continued journey in bringing OPM music closer to people. He is very grateful for all the OPM supporters and the opportunity that was given to him. Nyoy Volante's latest album under MCA Music, "Tuloy pa rin", is now out in CDs, available at your leading record stores. It is also available online via Itunes.